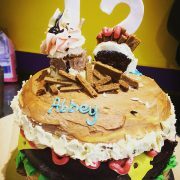 Giant Burger Cake for Abbey! Have you ever thought of a Burger Cake?? I mean a GIANT ONE! 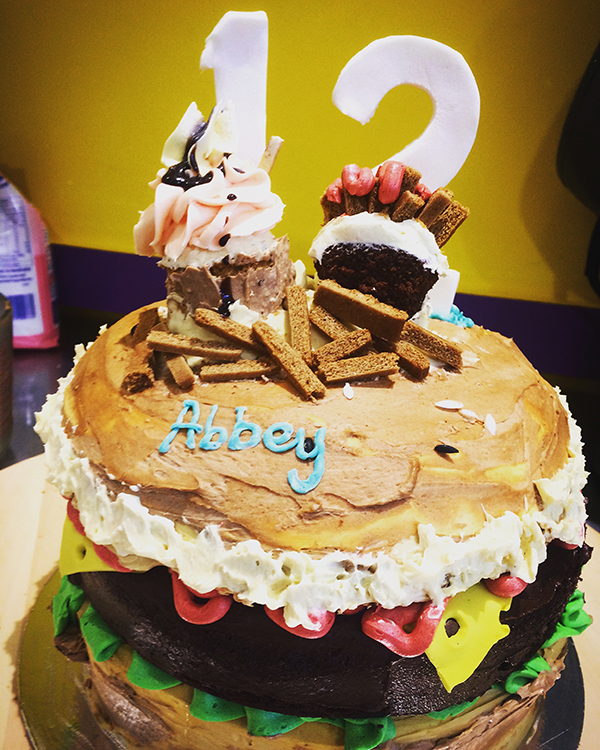 Recently I had a young customer came to me asking for a burger cake, she wants ’12’ on top of the cake, a milk shake and some fries on the cake because she loves food and this cake is all about food! Sounds pretty straight forward, but the only issue was the surface of the cake is very limited, I can only place so much components on it, and with the ’12’ it has to stand by itself, so need to carve it at least 1 day advance; and then it’s the cake, I have baked 2x 9inch vanilla as the bun, and 1x 9in chocolate to be the patty. After they have baked and chilled, it’s time to put them together. I pipped some green mint buttercream as the lettuce and made the cheese with fondant, another thing I did was to add some spiced apple into the cake to add more flavor and fun. After you had the lettuce and cheese, it’s time to place the patty in! I want to make sure every part of the cake is covered by buttercream so it will not dry out so soon, that means more work for me, but I just want to make this look and taste great and it’s all worth it! So I’ve covered the patty with chocolate buttercream, then red vanilla buttercream as tomato sauce…. finally it’s time for the top of the bun! Now we have a complete burger cake, oh can’t miss the fondant sesame! I wish we could just leave it like that, but there is more…. the fries were ginger biscuits as it was Christmas period so I have them handy; with milkshake and the fries I just re-constructed 2 mini cupcakes and put some make ups on them, then it’s time to put the ’12’ on. I think that was the most challenging part, as it’s not completely dried so it still might fall…..
https://www.runawaycupcakes.com.au/wp-content/uploads/2017/01/IMG_8850.jpg 750 600 admin https://www.runawaycupcakes.com.au/wp-content/uploads/2017/12/logo_full_250-1.png admin2017-01-07 13:58:562017-01-07 13:58:56Giant Burger Cake for Abbey!